Happy Friday! Hope your week was great and that you’re looking forward to an even better weekend. Random question, but does anyone else freeze when they visit the grocery store each week? I’m literally shivering by the time I hit the checkout line. That’s why I always wear some version of this outfit when running errands throughout the week. While I’d naturally choose shorts due to the extreme heat here in Texas, I sometimes prefer to still wear jeans so I can shop comfortably at Central Market. I get that they gotta keep the produce cool and prepare for the masses (more people, more body heat), but seriously. FROZEN! 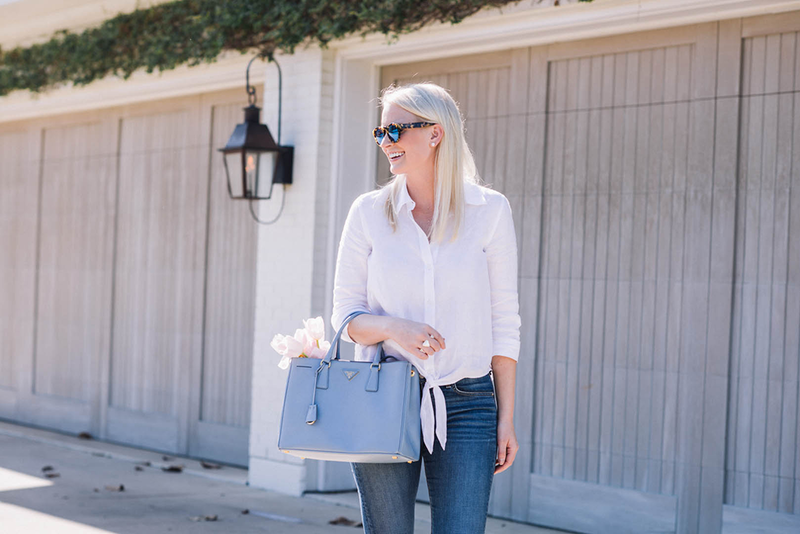 These are actually the jeans from my “ripping incident” from last week… RIP Rag & Bone. While I’m sad about the demise of my favorite blue jeans, I took this opportunity to try out a few new brands that I haven’t owned before. One of these is BLANK Denim. I was hesitant at first because this brand is so inexpensive, but because I’ve had such a good experience with BB DAKOTA (another budget-friendly line on Shopbop), I gave it a go. I ended up loving and keeping this pair! I cannot believe they are only $88. Loving the casual look, so cute! I meant looking good girl! Basics are best! Have a great weekend, Merritt! What a perfect summer outfit! 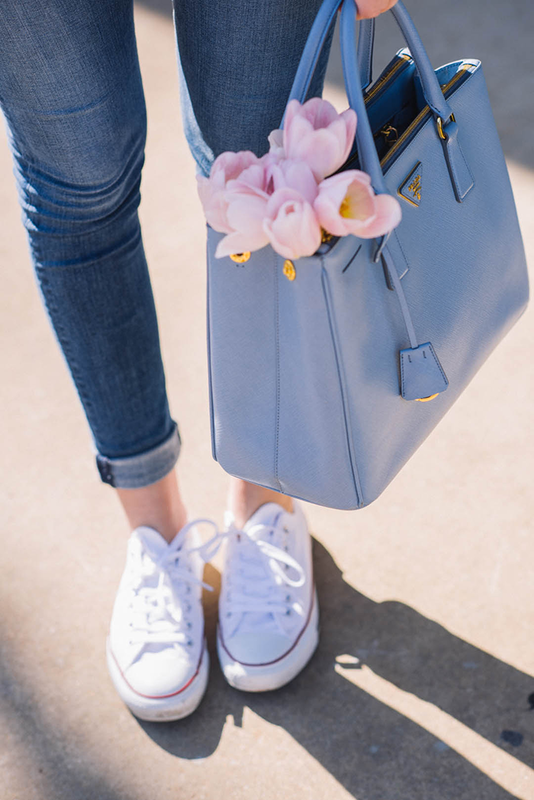 I have those same white converse sneakers, a summer favorite. Soo true about going to the grocery store in the summer! Sorry to hear about your jeans! They look so good on you, but Blank Denim is pretty cool too. I own a few pairs and the quality is great. 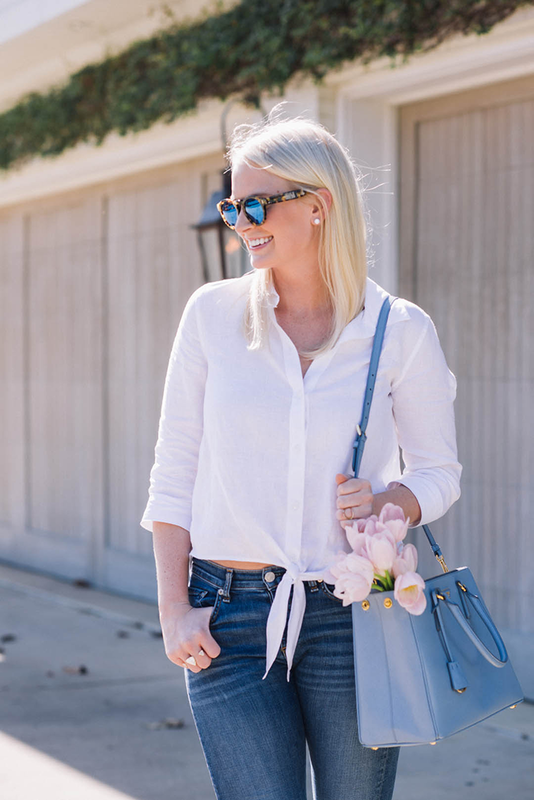 Perfect casual outfit for running errands! Loving those sunnies, girl! 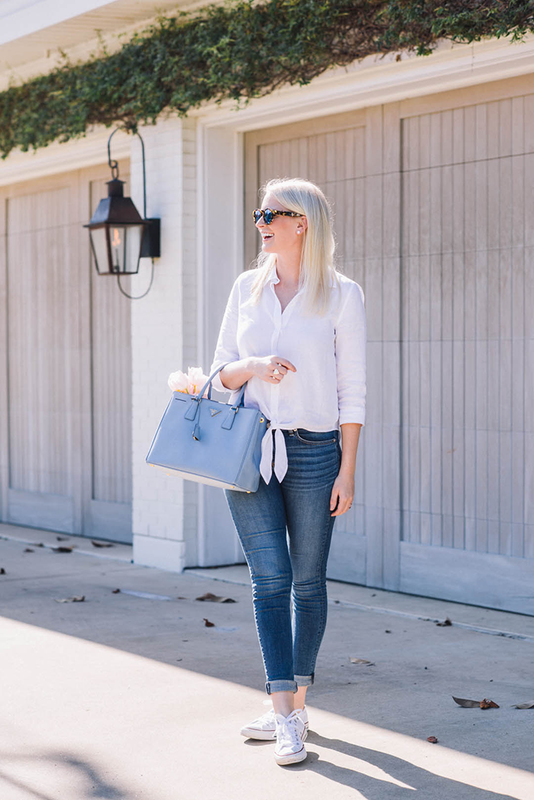 Such a great casual classic look… white button up & cons…fabulous. Love my Blank jeans! You’re making me want a pair of white Converse! Ah, they are so cute, though!!! And yes, I freeze in the grocery store, the office, and everywhere. I freeze my but of evertime I go to Costco…the coldest! Ooh I love the cropped tied blouse, so cute! And I am dying for your sunnies. They’ve been on my wish list a while- they’re so fun! Thought I was the only one who freezes at the grocery store. I have to take a sweater. That top is to cute BTW. Haha this is hilarous. I also freeze during shopping in grocery stores, it’s soooo cold!!! You look great, love this relaxed look!